I'm Pat, blogging as The Southpaw Stitcher. I grew up in Chicago, Illinois (USA) and am currently living in the suburbs with my hubby of almost 49(!) 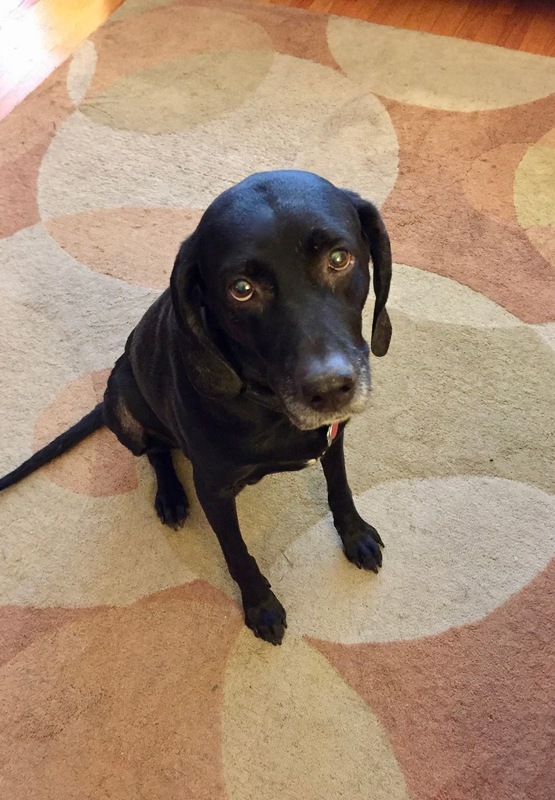 years and my dog Molly. You knew I wouldn't miss this opportunity for a photo of the Little Sweetie, didn't you? 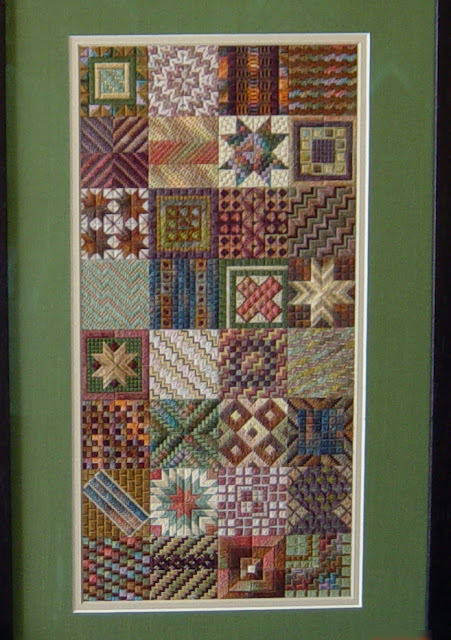 I started out stitching, like many of my friends, as a pre-teen doing surface embroidery and cross stitch on stamped fabric to make into dresser scarves, napkins, etc. Right after high school I discovered counted cross stitch, and did that almost exclusively for many years before branching out into other techniques. I started blogging in early 2011. Several of my friends were doing it, and Lelia from Stitches of Life sat down with me one afternoon and showed me all the ins and outs of Blogger. She was and is a great mentor! My blog title is pretty self-explanatory; I'm left-handed and, surprisingly, the name had not been taken at that point, so I grabbed it. Like many of us, I used to be a one-at-a-time stitcher. That pretty much went out the window after I started joining embroidery/needlepoint guilds. Now, I usually have 4-5 active WIPs going at one time, and I will work a little on 2-3 different pieces during the course of one day. That's part of the beauty of being retired! I guess my tastes are eclectic since I enjoy doing a wide variety of techniques. The current project that I find most challenging gets worked on for about an hour before breakfast. (I get up really early.) Right now, it's Copper Illumination by Kay Stanis. 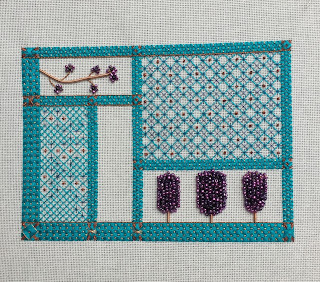 My deadline is the end of June, and now that I'm back to stitching it, it will most likely get done in time. I tend to like geometric designs. 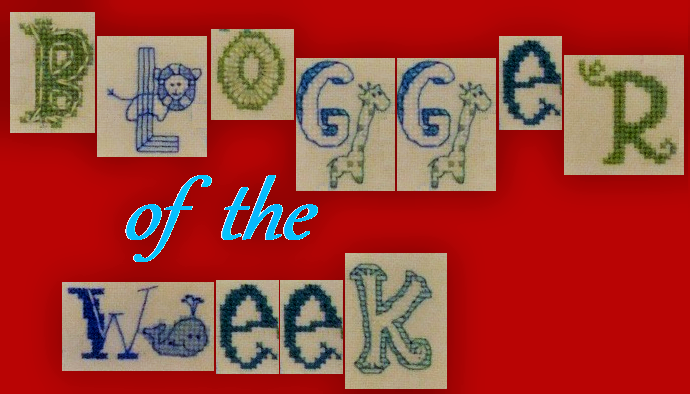 My favorite needlepoint designer is Kathy Rees of Needle Delights Originals. I've done a ton of her pieces, and have many more in my stash. For cross stitch, it has to be Prairie Schooler since I have so many of their designs. However, I also really like Plum Street Samplers, Rosewood Manor and Carriage House Samplings, among others. For blackwork, Elizabeth Almond and Tanja Berlin are pretty much in a dead heat. The photo is Rainforest Revisited, one of my Kathy Rees projects. The piece that I'm most proud of is Tanja Berlin's Eastern Bluebird, which won Best of Show at the Lake County Fair last year. My worst stitching disaster is a hardanger piece that I was about 2/3 of the way done with when I cut multiple threads of the ground fabric in the wrong place. There was no salvaging that one. I would like to have another go at needle punch. I tried it about ten years ago without success (it's supposed to be so easy), and I still have a set of expensive needles specifically for that technique. Once I finish stitching a project, it almost always gets finish-finished right away. My favorite way to finish? Giving my stitched pieces to other people and having them do it! For pictures I have a 92-year-old local framer who is a real gem, so I get those to him immediately because tomorrow's not guaranteed when you're that age! My small pieces: pillows, needle books, pin cushions and whathaveyou get sent to Averyclaire, who is one of my good friends and lives close by. She finished this drum pinkeep and the Eastern Bluebird, too. I'll go with the Uptown Stitcher because I'm no spring chicken and I love stitching--although I don't dress like her. At all. Well, this really isn't a secret, but it might surprise the folks that I currently hang out with. Back in the day (early-80's), I used to love going for a canter (sometimes a gallop) on the trails of our local forest preserve on the weekends. 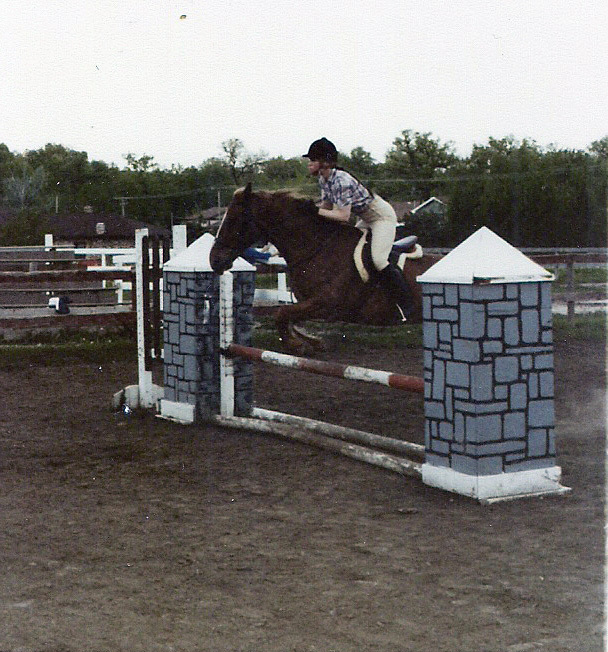 I even took jumping lessons for a while, which kind of terrified me. 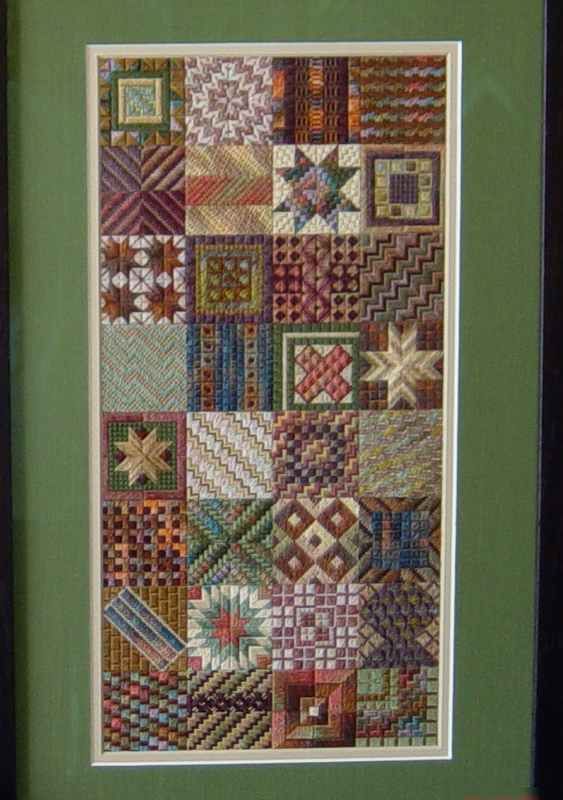 I've really benefitted from the various embroidery and needlepoint guilds that I've joined. I've learned many new techniques which is why my tastes are so eclectic, and made some good friends, too. Thank you, Jo, for hosting this blog and for the fun blog hops that you organize throughout the year. I am a follower of your blog but it is always nice to learn more about you! I just love your Uptown Stitcher but all your stitching looks great! Hello Pat. Molly is precious. Rainforest Revisited is really gorgeous. Oh that bluebird is truly wonderful. Hi, Pat! Always nice to find another left-handed stitcher. :) Your work is lovely - that rainforest piece, oh my! - and Molly is precious. Nice to learn more about you Pat. I have been following your blog for a while. Love all of your pieces. Nice to meet you Pat!AriadnefromGreece! Lovely to read about you Pat.Your cross stitch and needlepoint are beautiful. HI Pat, Nice to meet you and I'm looking forward to visiting your blog. I rode at one time too but would never jump! Great photo of you jumping. The quilt looking piece is gorgeous!! I love your bluebird, congratulations on best of show!! Lovely work that you do, Pat. Uptown Stitcher is such a nice lady, I just love her. Hello Pat, nice to meet you! You seem to have mastered quite a selection of techniques, your finishes are awesome! Great answers. Thanks for sharing. Love all your projects. Thank you for sharing so many designers, I will check them out. Great to meet you and to see your projects. Lovely to meet a fellow lefty. You have some beautiful pieces there. Love the copper piece. Nice to read about you Pat. I love Rainforest Revisited. The colours are gorgeous. Hi Pat, great post - I love your "secret" - that must have been so much fun! I do love the finish on the bird and the drumkeep! It's so nice to learn more about you. 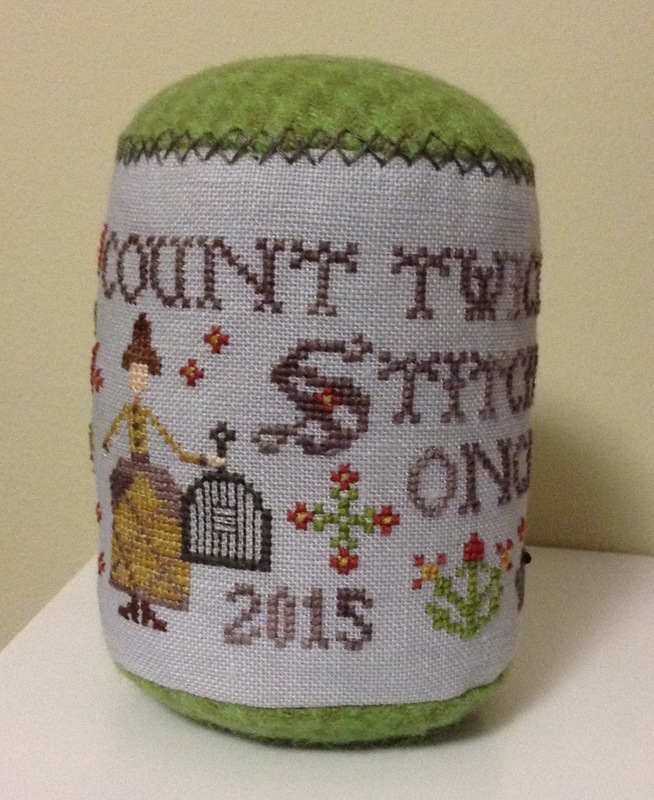 Your stitching is beautiful, good for you getting them finished as soon as you're done! 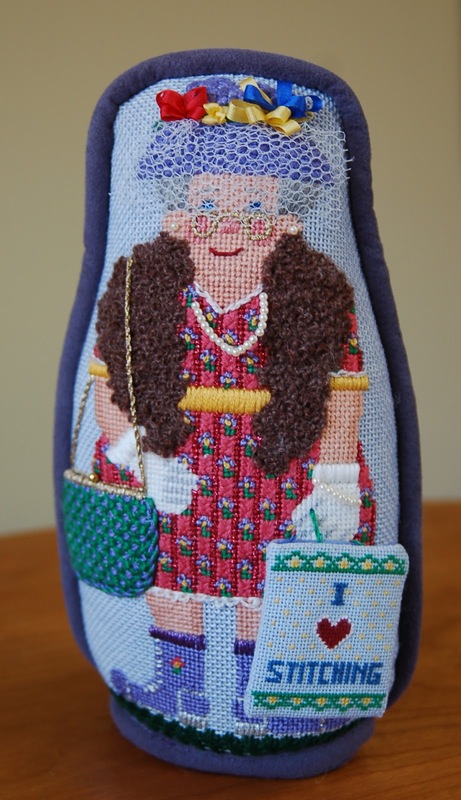 I also have punch needle supplies, and need to learn.